October 2014 | Just Mi! First of all, HAPPY BIRTHDAY to my Halloween baby...my little sister! Now, it's time for FabHER Friday!!! I hope everyone has a safe weekend! Enjoy yourselves and wrap up...the chill is coming! What to put in your gym bag in preparation for the gym! A few weeks ago Femme Fitale Fit Club hosted this link up. 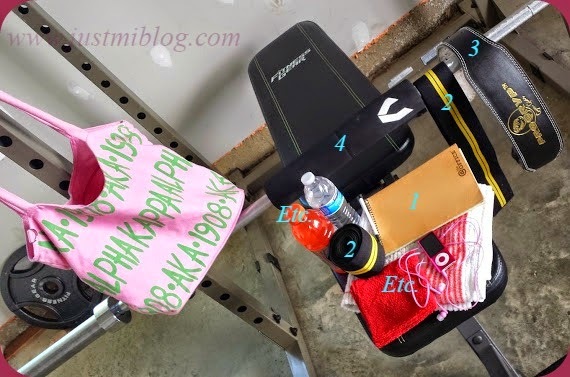 I thought this was a great topic...so I wanted to talk about what's in my gym bag! (1) I use this notepad to write down the exercises I do each time I work out. I have every workout I've done since June 2nd (2014). Writing down the exercises allows me to track things like how much weight I'm lifting; how many reps I'm doing with the weight I'm lifting; and it allows me to plan future workouts. I was working out last year before I moved but the notepad I was using definitely got lost in the shuffle. Here's an old post though! (2) When I first started working out, I was playing around with the weights and unintentionally hurt my left knee. Something's out of whack and now and when I lift anything over about 90 pounds I have to wear the wrap around my left knee. When I lift even heavier weights (anything over about 150), I wear the wraps around both knees, for safety measures. The wraps take some pressure and stress of the weights off the tissues around the knees. You kind of have to get a feel for the wraps and learning when it's time for you to wrap. You don't want to wrap too early because you're trying to strengthen your knees/legs. They can't get stronger if you're preventing them from feeling the weight! It's still best to err on the side of caution! (4) This is something that I've had to invest in as I started lifting heavier weights. I don't know if it's the position I hold the bar or if my back/shoulders are just not built for that type of weight, but I needed something to take the pressure off my shoulders. After squatting, my shoulders would be the sorest things on my body, not my legs. Before the pad I was putting a towel between the bar and my back, but that wasn't stable enough. So I bought the bar pad, which takes some of that pressure off and has helped me lift more weights! Safety is always key!! ~I always bring water and I some times bring a gatorade. Gotta stay hydrated! ~When I go to an actual gym, I some times use my iPod. When I'm at home, I use my computer and a Bose speaker. The acoustics in the garage are great. Some use music to get pumped up, but I actually prefer the quiet. 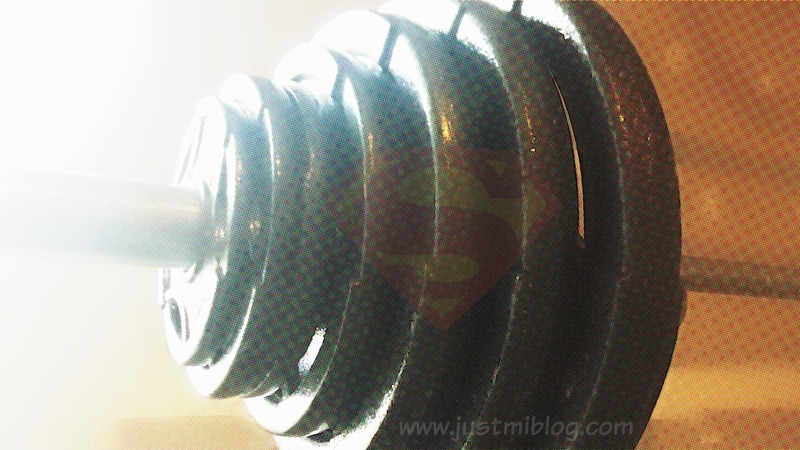 I'm a concentrator, so I talk to myself as I'm working out. I don't rely on the music to get my hype. Some times the music distracts me...because I'm too busy dancing...lol! ~I some times drink a pre-workout, but I don't get the "desired effect" from it, so I rarely use it. I know it sounds like I'm tugging a lot to and from the gym, but I like to be prepared. It also helps that I work out at home the majority of the time, so things are easily accessible. What are some things you carry in your bag that aren't in mine?! Hi guys!! FabHER Friday is here again!!! We're here to connect ladies in the blogosphere to one another. We all know how fantastic it is find great blogs that you can add to your list, so why not link up?! You can share posts of your choosing, old or new. Pick a fave, share, and hop around to the other links listed! I look forward to reading everyone's post and I hope you all have a beautiful weekend! How has my workout changed? I was reading some of my posts and thinking to myself, "Mionna! Why are you so wordy?!" So, this post won't be long at all! As you can see, I've been doing some work. I haven't been to a gym in a while, but I'm still making my squat rack work for me. I know my next couple of updates will be a little light because the holidays are coming up and I'll be doing a lot of traveling. This is the time of year when I wouldn't be surprised if most people's workouts get a little light when they should be the heaviest! LOL. However, I'm going to keep myself motivated!! What are some things you do to keep yourself motivated?! Since cutting out some of the unhealthy foods I eat, I've fallen into a rut of cooking the same foods often. A friend inspired me to spice up my regular old spaghetti recipe...so that's exactly what I did! 1. Sauté the diced onions in a little olive oil. I like to season my onions with a bit of salt, pepper, and onion powder for some extra flavor. 2. Add the sausage and allow the sausage the onions to cook together. 3. Before removing that mixture from the pot, add the carrots and allow them all to cook for a few minutes. 4. Remove the mixture from the pot, brown, and drain the ground beef. I seasoned the beef with salt and pepper only. I didn't want to add different seasonings since I was using so many new ingredients. 5. Combine the sausage/onion/carrot mix with the ground beef and add as much or as little spaghetti sauce as you'd like. I used half of a 45 oz. jar. 6. Add sugar and stir. I usually don't use sugar, but my mom does so I knew this would be a small but perfect addition. 7. Simmer for about 20 minutes. 9. Add spinach and parmesan then stir. The cheese is supposed to make the sauce creamy and rich. 10. Add about 3 tbsp. of pasta water into the spaghetti sauce. This is supposed to bring the flavors together and improve the texture of the sauce. 10. Add butter before serving the sauce. This is supposed to make the sauce rich and smooth...a tip from the professionals! You want to talk about some good spaghetti?! THIS was some good spaghetti. 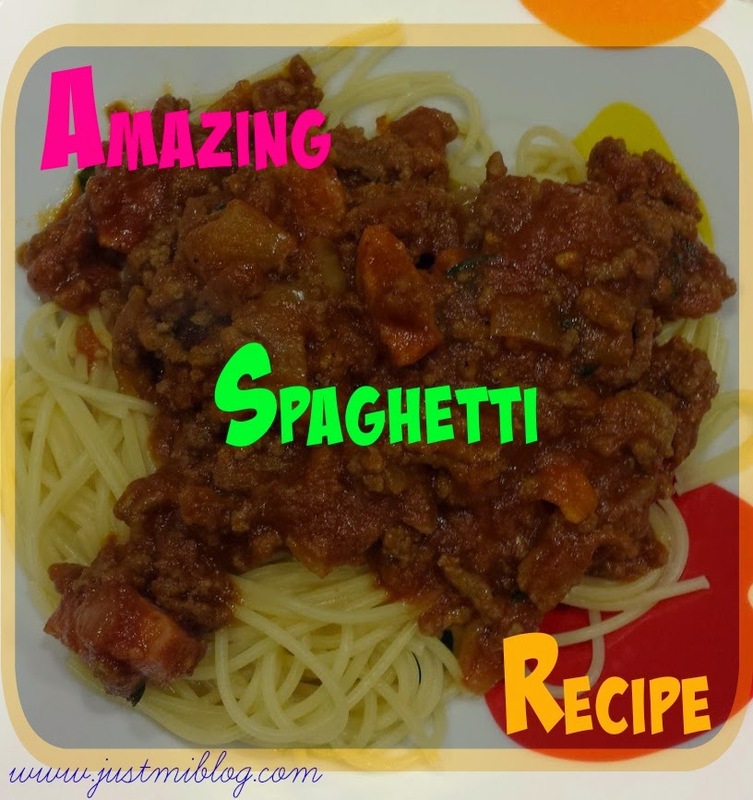 Introducing a few ingredients to the pot turned boring spaghetti into Amazing Spaghetti! The portion sizes of this recipe are little on the small side. I usually cook a larger pot of spaghetti, but I didn't think I would want to eat spaghetti all week. I cut the portion sizes in half but I was still able to get 4 significantly sized portions out of this. Next time I'm definitely making a bigger pot! Also, if you want to make a homemade spaghetti sauce, these instructions would work well for that! Well hello to you all!! You know what today is right?! FabHER Friday!!! This blog hop is a way for ladies in the blogosphere to link up with one another. You can share posts of your choosing, old or new. Just pick a fave, share, and hop around to the other links that are listed! We've got all weekend! I hope you all have a great one! Let's start this post off by giving me a round of applause for making it this far. If you remember this post, then you understand where I'm coming from. Here's the real. I paid for this hair and it's on my head, so I have to make sure it's maintained properly. I questioned myself about what I wanted to do with it. My thought was, let's get past my birthday without looking crazy first, then I'll make some decisions. Goal Accomplished! 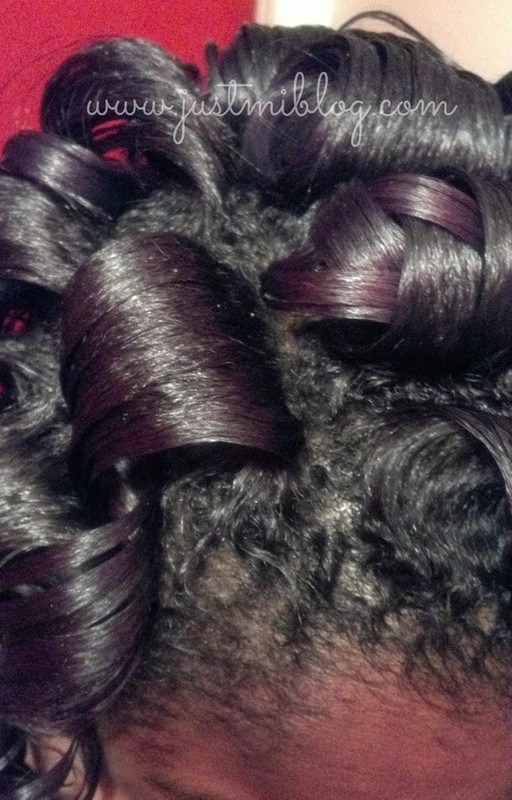 I don't put products in the hair because everyone (knowledgeable about sew-ins) says products will weigh it down. 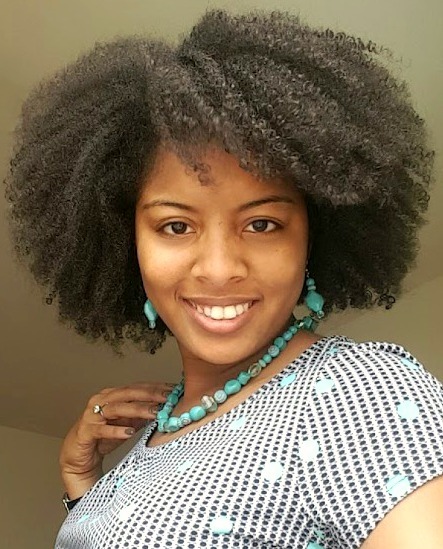 The stylist said natural oil from my hair would eventually spread throughout the sew-in and I'm guessing that's what's happened because it seems the hair has become "weighed down". FabHER Fridays is here!! This blog hop is a way for ladies in the blogosphere to link up with one another. You can share posts of your choosing, old or new. Just pick a fave, share, and hop around the other links! As you read last week, I recently celebrated a birthday!! I had an outfit in hiding I decided to dust off for a night on the town. My Outfit Of The Night (OOTN)!! This outfit gets two thumbs up! 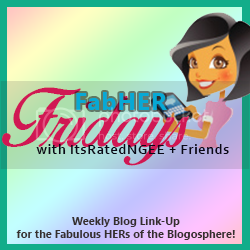 FabHER Fridays is a way for ladies in the blogosphere to link up with one another. You can share posts of your choosing, old or new. Just pick a fave, share, and hop around the other links! I'm currently watching these Nats!! I unintentionally tasked my boyfriend with doing something special for my birthday weekend. I hadn't planned anything and the only goal I had was to get 'dressed up'! 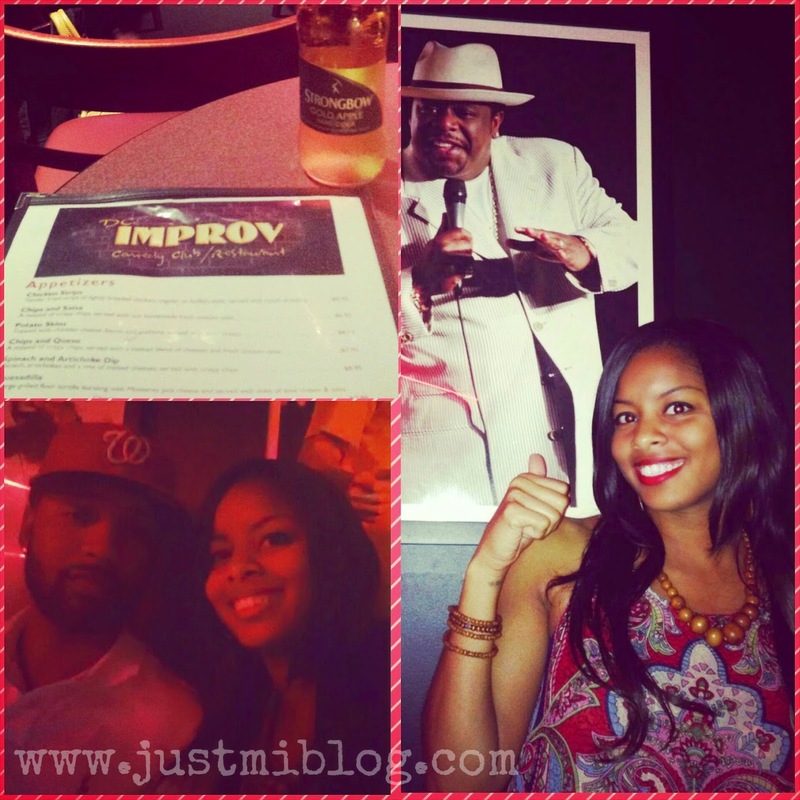 Friday night we enjoyed a comedy show at DC Improv. There was a comedic MC, two comedians and the feature comedian Bobby Lee. I don't know if you guys used to watch MADtv, but he was one of the cast members (during the Key & Peele era). All of the comedians had enough joke in them to make me laugh, so I was pleased with the night. Each morning included breakfast. If you know me, you know I love breakfast food at any time of the day!! Most days my body can't always make it up in time to enjoy some of the breakfast places I like but I guess that's why birthdays are special. I found my signature breakfast sandwich for when I'm on the go...and of course, I had my fave...IHOP!! The weather during the work week before my birthday had been drab. You could tell autumn was nearing by the consecutive days of 70-something degree weather. I'm a Fall baby, so this is prime time for me but I was a bit worried about what Saturday would look like. Thank goodness God saw fit to kiss my cheeks with beautiful sunshine!! I won't share all the details of my beautiful birthday but my boyfriend is an amazing planner. 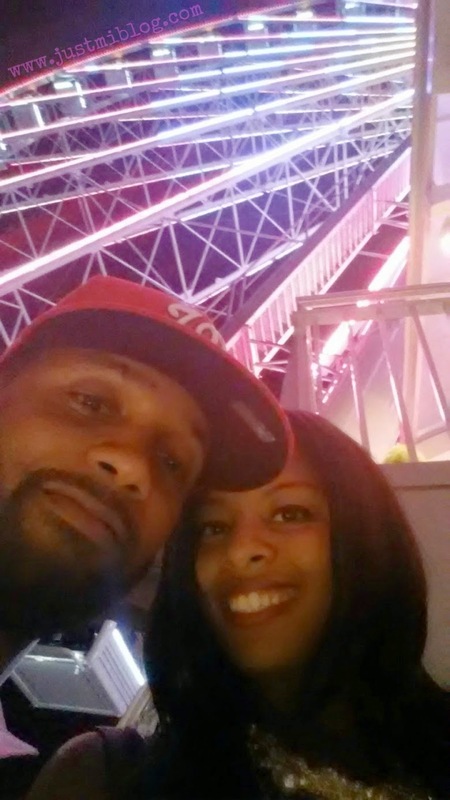 Saturday included some shopping at Tanger Outlets but the highlight was some of our night time plans. 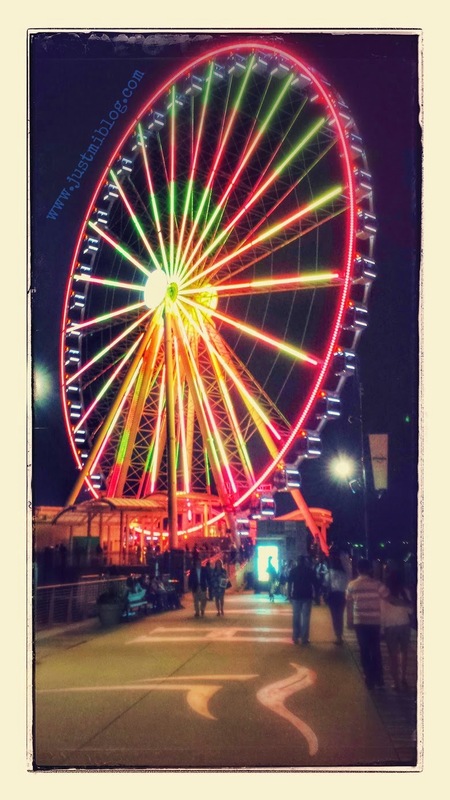 I finally got to ride the new ferris wheel at the National Harbor!! We also stayed at the harbor for dinner at Bond 45, an Italian steakhouse. After having one of their steaks, our standards for steak (and asparagus and spinach) have been set pretty high! Their cookies need a little work...lol...but over all the food amazing! My family and friends showered me with love and well wishes. I'm so appreciative for being a thought on people's minds...especially on a Saturday. I've always felt like my birthday was one of the best days of my year and people who help make it even more special have a special spot in my life for that year!! It kind of helps me put into perspective my relationships with people but not to the point where you have no place if I didn't hear from you. I know things come up and people get busy, etc. etc. etc...but I appreciate being thought of! Who doesn't?! So thank you for all the Google+ messages, emails, text messages, FB messages, IG comments, twitter shoutouts, and anything else I might have forgotten!! You all are the BEST!! Also a great big muah to my babe!! P.S. Don't forget to come back tomorrow! !